Woodbury PTA: Red Ribbon Week is HERE! Red Ribbon Week is here and the theme is "The Future is Key. What will you be?" To celebrate Red Ribbon Week we will have a number of activities throughout the week. Each day has a designated dress up day and we encourage all children to participate. Our goal is a school is to collect 600 pounds of pennies! Search those couch cushions and bring your pennies to school throughout the week. 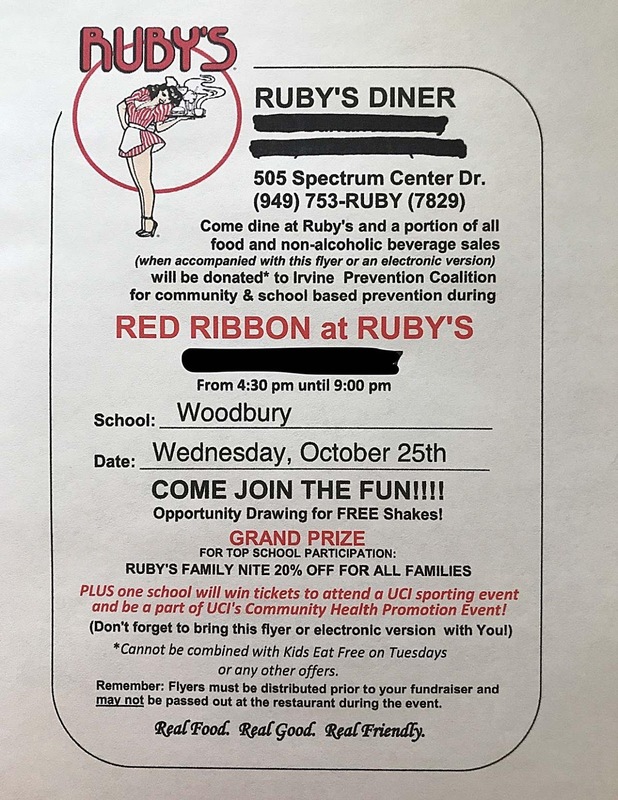 Join us at Ruby's Diner on Wednesday, October 25th from 4:30pm - 9:00pm Bring or show the flier below and a portion of the proceeds will be donated to Irvine Prevention Coalition. On Wednesday, October 25th, students will walk to school to show their commitment to a clean and healthy lifestyle. Meet at the picnic shelter next to the playground near Lamplighter and Sanctuary at 7:30am.